Going to the movie theater costs more now than ever before. Shouldn’t you be able to see every second of the movie you pay for? The solution is to have the theater set up more like home and simply providing each member of the audience the ability to pause the movie when needed, this would allow audience members not to miss a second of their favorite films. With a theater like this even those with the smallest of bladders won’t be afraid to go out to the movies any more. Each seat in this revolutionary theater would be equipped with some simple controls that would allow the viewer to pause the movie when they might need to. When a viewer needs to go to the bathroom for instance, they would simply hit the pause button on their armrest then proceed to the bathroom. 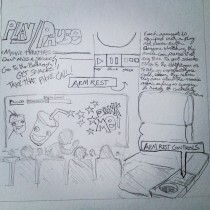 When they return to their seat, by pushing the “resume” or “play” button, the movie will continue right where it had left off. 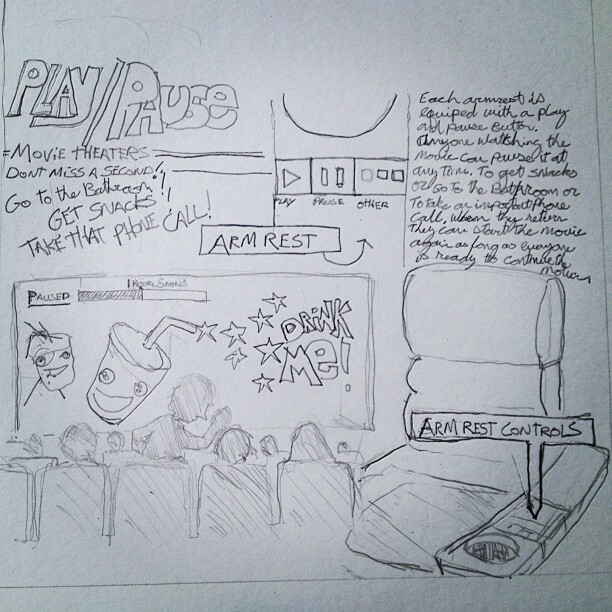 In order for the movie to play, every seat must be in “Play” mode. This give everyone an opportunity to freely go about important business that may otherwise disrupt the movie. For epically long movies like the Hobbit this type of theater is a must. Nature calling will no longer be an issue for such long movies, hitting the pause button will give you what ever amount of time you might need to carry out your business. If you are hungry and need some healthy snacks from the concession booth, pause the movie, get some snacks and return to continue the movie right where you left. I know at home it’s nice to pause the movie to fact check things pertaining to the movie, so now you will have time to do such tasks. With a theater like this it really puts the audience in control. When you pay top dollar for a movie experience you shouldn’t have to miss the movie just because you have a tiny bladder or have important phone calls coming in. Well, in addition to pausing the movie the remaining audience members in the theater would be shown a variety of consumer opportunities until the movie resumed again. It’s really win win. Previous Previous post: Picklefest 2012!